INTERPRETIVE GUIDES NEEDED FOR Body as a Work of Art: More than Skin Deep. Engage museum guests as they explore this immersive exhibit about social media influences on health and wellness, the beauty behind disease and the many amazing shapes and types of bodies people live in. As a Docent/Interpretive Guide, you will guide guests, answer questions and bring the exhibit alive. Contact mheartlein@thehealthmuseum.org for upcoming training. Join a growing group of students, community volunteers, and medical professionals. Motivated to become an engaged part of our team. Committed to a positive guest experience. Willing to share talent, skill or knowledge. A role model for career choices in science and technology. Undergraduate and graduate student internships available, as well as work study opportunities for Baylor Medical Students and undergraduate students from the University of Saint Thomas. Help the exhibits come alive! Staff a mobile information station where Museum guests can choose to briefly interact with a ‘real live’ person inside the exhibits. Carts include a variety of models and demonstrations featuring the circulatory system, respiratory system and general nutrition. Introduce the public to the Museum and its programs through attendance at festivals, corporate wellness days and schools. Volunteers pass out materials and demonstrate nutrition basics by showing models of fat and muscle, plus sharing specific nutrition information on the salt, fat and sugar content of common foods. Please email a resume to volunteer@thehealthmuseum.org or visit the online application for job descriptions (link below). Become part of our Visitor Services team to ensure our guests have the best possible experience. 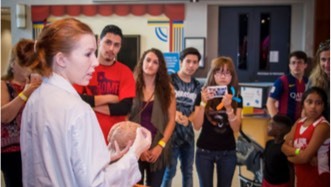 Summertime is when The Health Museum has many opportunities for teens (15 TO 18) to volunteer. It's when we get to know each other. Teens from this summer volunteer experience are then selected to be a member of our museum volunteer team year-round. See Youth Volunteer page for more information. PLEASE NOTE THAT THE APPLICATION FOR SUMMER TEEN VOLUNTEER OPPORTUNITIES ARE CLOSED FOR 2018. If you are at least 18, and have graduated from high school, you are eligible to attend a pre-placement orientation to determine your volunteer interests. Please fill out an online application. This application is for adults only. There are several Special Events throughout the year at the Museum. Service Organizations are welcome to inquire about episodic volunteer opportunities for groups. Please email all inquires to volunteer@thehealthmuseum.org. Start your volunteer journey today. Fill out the online application linked below!